In a 1972 interview, while on the topic of how we as viewers yield meaning from works of art, Susan Sontag concluded with this thought: “I do not view the intellectual experience of art as [being] opposed to the aesthetic experience. I think the aesthetic experience is a form of intelligence, and that a great deal of what people call intellectual activity is aesthetic. They’re two parts of the same thing.” (2) It’s a useful frame of reference in assessing the practice of New York-based artist Landon Metz, whose work is similarly centered on the idea that an artwork’s visual attributes might embody its content rather than merely signify it. This is especially true of his most recent output: a sequence of paintings rendered in pigmented liquid dye on unprimed canvas which, in their equating of content and form, neatly lend themselves to the same direct, comprehensive viewing experience to which Sontag refers. Metz’s work is grounded in a thorough awareness of the material and immaterial functions of a committed studio practice: from carefully selecting his brand of pigment based on its archival qualities to accounting for the subtle influences of humidity and gravity on the drying process, each active element in his presentation is acknowledged and utilized towards a particular conceptual end in the resulting object. Take, for instance, his approach to supports: for the works discussed in this text, Metz built and used stretchers of three specific sizes (37.5 x 30”, 62.5 x 50”, and 80 x 64”), precisely measured to share a common mathematical ratio. His strict adherence to these measurements serves two purposes: on a formal level, the resulting canvases are large enough to accommodate gesture and contain broad washes of color, but still small enough to accentuate elements of drawing and line. Just as importantly, these measurements also establish a specific physical relationship with the viewer – each is sizeable enough to allow visual entry, but not so imposing as to discourage close physical readings. This level of intentionality is typical of Metz’s practice: in approaching his process as both vehicle and content, no technical detail is deemed negligible, no functional aspect overlooked. Informing these decisions, meanwhile, is a set of concepts which guide Metz’s conduct both in- and outside of the studio. Central to this underlying framework is the idea that our perceptions (both sensual and existential) are deeply selective, entirely relative, and potentially malleable, less a matter of prescription than of subjective interpretation. It’s a notion that lends itself to any number of philosophical and scientific principles, of course, but in reconciling the visual and theoretical aspects of Metz’s practice, there are two in particular whose influence on his work bears discussion. The first is non-dualism, the classical doctrine emphasizing a fundamental unity among all elements; within this philosophy, perceived differences between entities or ideas – e.g., subject and object, positive and negative, even “something” as opposed to “nothing” – are dismissed as both illusory and counterproductive. The second is that of interconnectivity, wherein each component of a given arrangement is understood to be mutually dependent on the others. As in non-dualism, interconnectivity ultimately promotes the idea of a single underlying union, but where the former denies any separation between constituent elements, the latter holds that a given entity might belong to a larger whole while still retaining its individuality. Both concepts ultimately speak to the relativity of sensual experience while confirming the possibility of a larger, more intricate framework. As will become apparent over the course of this text, one finds aspects of these two concepts echoed throughout Metz’s practice, at times subtly but always purposefully. In scanning Metz’s output, we find these conceptual underpinnings conveyed through consistently elegant aesthetic treatments. Although he retains a process-oriented practice, Metz has, from the outset, embraced the viewing experience as something sensual, open-ended, and unapologetically visual. While he shares with many of his peers an investment in material experimentation, Metz distinguishes himself through his ability to translate those formal investigations into deliberate, articulate canvases; where others’ emphasis on methodology so often results in muddled surfaces and arbitrary compositions, his application at each turn remains steady, confident, and deliberate. But while the accessibility of Metz’s aesthetic is undoubtedly a large part of the work’s appeal, to simply call his presentation “beautiful” is to miss an important point. Beauty, after all, isn’t solely a matter of aesthetic assessment: in the hands of an inclined artist, it can also be understood as a tactic, a strategy employed towards seductive (read: persuasive) ends. It serves as a means of engendering resonance and investment on the part of the audience – to deem something beautiful is inherently an act of self-identification – and, having established that connection, providing them with an argument that might not have been grasped through the visuals alone. Recognizing beauty’s capacity to serve as both ornament and conduit is absolutely crucial to understanding Metz’s paintings, whose output does more than simply allude to the aforementioned philosophical concepts – it actively illustrates them, with the works' content lying not only in the resulting image, but also in the techniques used to produce it. By retaining an accessible visual presentation, then, he ensures not only that the work offers a rich aesthetic experience, but also that even if an invested viewer fails to grasp – or actively chooses to disregard – the work’s philosophical implications, those ideas can still be directly conveyed through the harmony and balance contained within the compositions themselves. Of course, for audiences conditioned to equate visual opacity with conceptual weight, the seductiveness of Metz’s canvases can make, at least at first, for a disarming viewing experience: when sensation is presumed to be antithetical to intelligence, ones very enjoyment of a given item renders its merit suspect. But this, in part, is precisely what makes Metz’s work so appealing: at a time in which “understanding” an artwork has, for many viewers, become a prerequisite for valuing it (which is to say nothing of actually liking it), Metz produces objects of both intellectual substance and considerable, immediate visual reward; though conceptually grounded, the work is utterly available to its audience, there to be experienced rather than merely comprehended. The viewer needn’t defer passively to prescribed readings or theoretical justifications to find gratification in these works; the viewing experience itself provides much in the way of both sensuality and intelligibility. For Metz, then, aesthetic accessibility serves a very specific purpose: it provides a point of entry, a means of encouraging a direct, consequential encounter between artwork and viewer. Neither simplistic nor conservative, the willful appeal of these paintings reads to me as at once functional and, within the current climate, provocative, an overt argument for how we might more meaningfully engage with works of art. Thus far, Metz’s commitment to these ideas has proven stronger than his attachment to any single technique or material. Where artists of previous generations might have spent their careers developing and refining a single style, Metz has dedicated himself instead to exploring a set of fundamental principles which lend themselves to any number of visual strategies. His process is one of constant revision and renewal: though he aims with each new series to arrive at some definitive gesture, discoveries made in the studio invariably raise new questions to consider, new directions to pursue. As a result, he has built over time a body of work which explores a common underlying premise to markedly different ends, each series distinct from the others in both approach and appearance. Consistent even in its formal diversity, one might therefore think of Metz’s practice as an ongoing process of translation, with a given set of ideas finding articulation through a series of self-developed visual languages. Metz’s integration of new techniques tends to reflect insights gained from preceding projects. As such, in assessing his most recent output, the viewer benefits greatly from an awareness of what came before. Towards that end, one might begin with “Portrait of a Man” (2010), his first mature body of studio-based work. That series found the artist approaching paint as a sculptural material in itself: applying oils directly from the tube onto primed canvases, Metz combined dense mounds, daubed accents, and thin, snaking lines of paint to create works of physical rigidity, tactility, and dimension. Having completed these works, his interests turned to investigating more thoroughly the negotiation of positive and negative space within a two-dimensional field. 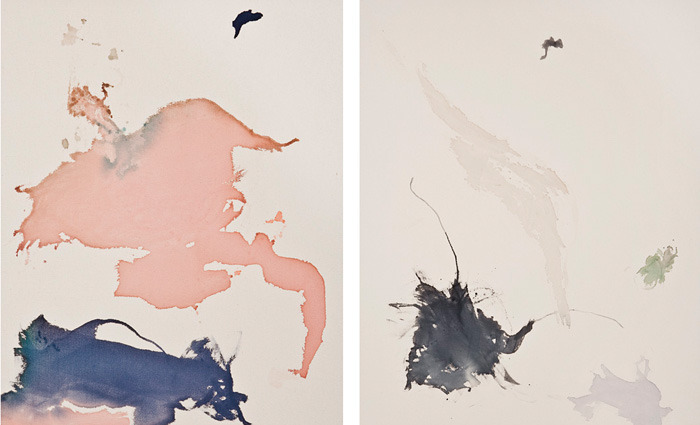 Abandoning his oils, he began to experiment instead with enamel, using brushes, hands, and rags to spread the slick paint across unprimed canvases in energetic, highly gestural flourishes which, in their overt physicality, recalled both Yves Klein’s Grande Anthropophagie Bleue canvases and De Kooning’s mid-60s oils and gouaches. 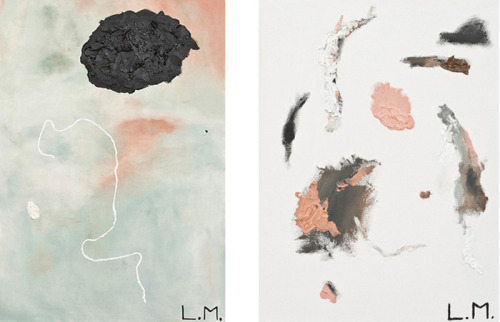 Out of the two series Metz produced with enamel paints – “The Leaf And The Wind” and “Grand,” both 2011 – emerged three motifs that would define the works that followed. First, where the “Portrait” canvases had achieved a literal sense of dimension by building up layers of oil paint that physically reached toward the viewer, the enamel works found Metz instead thinking in pictorial terms, using spatial tensions and color interaction to create a sense of movement, rhythm, and, most importantly, depth. Second, as he observed the effects of gravity on what is an exceptionally fluid medium, Metz increasingly found himself modifying his own gestures to accommodate, reinforce, and exaggerate the natural flow of the enamel. Over time, this balance between his materials’ essential traits and his own artistic intention would prove exciting enough to prompt a fundamental reshaping of his process. Finally, that these various negotiations played out on unprimed canvas is significant, as this introduced to Metz’s practice the idea that rather than function as mere support, the ground might instead play an active role, both visually and conceptually, in the creation of a painting – that it might, in other words, be considered a viable medium in its own right. With these motifs in mind, Metz began looking for a material that might better translate his current aims. Following a period of experimentation, he eventually found it in pigment-based liquid dyes, a medium which, though unfamiliar to him, seemed uniquely suited to his interests. For one thing, the dyes were generally more difficult to control than the oils and enamels he’d previously used; rather than simply apply and manipulate this new medium, Metz would have to work with it, actively recognizing, responding to, and incorporating the dye’s natural tendencies into his process. Furthermore, where oil and enamel paints had coated his surfaces, the liquid dyes, having no texture of their own, could actually merge with the canvas, allowing the ground’s textural integrity to remain intact. This seamless integration of medium and support would allow for a more subtle investigation of pictorial strategies, as within a unified picture plane, edges needn’t suggest physical boundaries, forms are no longer self-contained, and there is no material distinction between foreground and background. 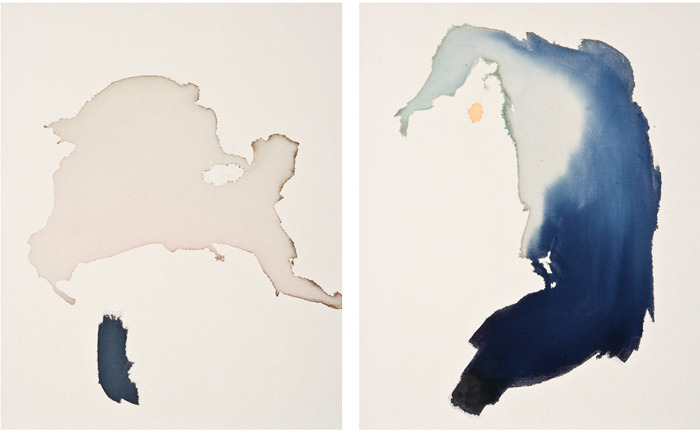 The dye paintings, then, would largely be about doing away with notions of separation – between material and ground, between positive and negative space, even between artist and medium. Over time, Metz developed a functional process for creating his new works. First, after mixing powdered pigments with water in a mason jar or plastic Poland Springs bottle, he would pour the liquid dye directly onto a stretched, unprimed canvas lying face up on the studio floor. Then, using either sponges or his bare hands, he would proceed to guide and press the pooled dye into the threads of the canvas – an instinctual, highly responsive process in which both form and composition reveal themselves gradually. The applied liquid then takes several days to dry, during which time Metz would refine shapes, alter opacity, and create gradient effects by subtly shifting the canvas’ resting position, allowing gravity to influence the creation of form. As the canvas eventually absorbed the dyes, the picture plane would become a homogeneous textural field, the resulting work a static document of the painting act itself. Both technically and conceptually, the process immediately calls to mind to the “soak-stain” methods of Helen Frankenthaler, whose influence can be seen throughout Metz’s catalog. 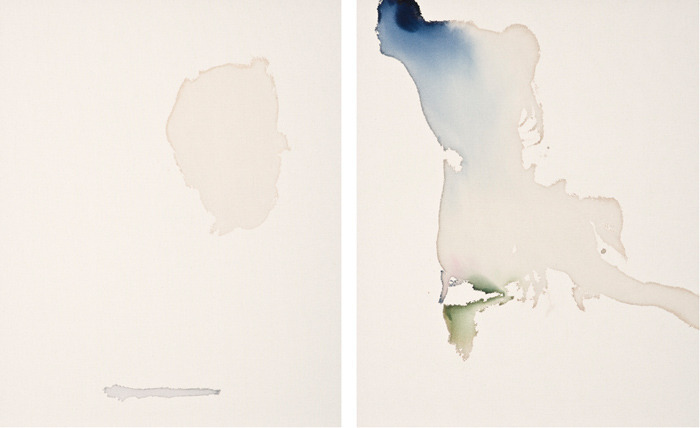 There are, of course, a number of important distinctions between her approach and Metz’s – among them, that Frankenthaler used turpentine-thinned oils (resulting in a distinctive “halo” effect), often incorporated drawn lines into her compositions, and frequently retained references (either pictorially or in her titles) to real-world subjects (eg, land- and seascapes) – but those differences are offset by a few fundamental similarities: namely, that both painters explore the functional integration of medium and support, emphasizing a literal surface over illusory depth, and each demonstrates a wish to imbue the subtleties of watercolor with the authority of larger abstract canvases. Other aspects of Metz’s process, meanwhile, can be traced back to the progressive facets of 1960’s European painting. One useful point of reference would be the Supports/Surfaces movement, whose work explored the material realities of painting by isolating and activating each of the medium’s constituent elements (ie, the stretcher and canvas) as potential media in their own right. 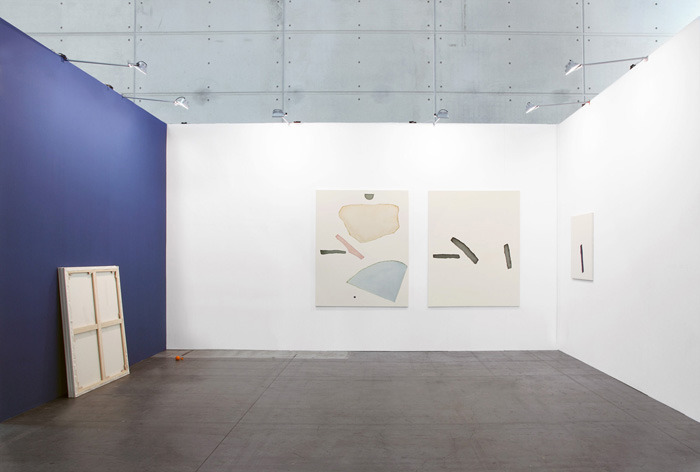 Of this group, one finds in Metz’s paintings a particular connection to the work of Simon Hantaï, whose “pilage” method of staining canvases produced a similar shift in visual planes. Crucial to both painters’ work is the idea that each apparently “blank” portion of a given canvas plays an active role in defining the effects of color, form, and depth; because paint no longer retains a dimensional or textural boundary in these dyed works, questions of foreground and background are rendered immaterial, and negative and positive space can be understood as being interdependent, equally engaged and equally necessary. 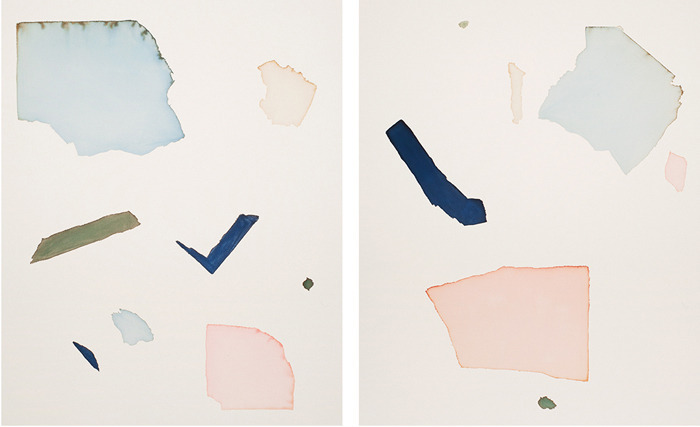 The first series of paintings Metz completed with his new medium, “On Water” (2012), is perhaps most notable for its overt blending of agency and chance. Compared to subsequent works, these initial paintings feel immediate, animated, and above all, exploratory, veritable documents of the artist’s gradual – and visible – acclimation to an unfamiliar process. 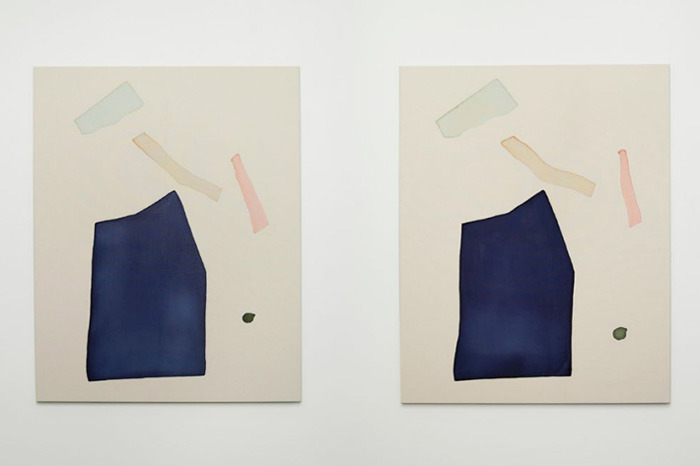 As the series progresses, for instance, we see Metz’s palette gradually shift from loud, concentrated stains to the softer, subtler, more diluted hues he would favor almost exclusively in later paintings. At the same time, we see him beginning to experiment with visual depth through the use of color placement and gradient effects, steadily developing a sense of push, pull, and movement. Even as the compositions become increasingly deliberate, however, one senses his willingness to yield to his materials, embracing unplanned effects – a random splash, an unexpected contour – as points of departure and allowing the dyes’ natural tendencies to guide him in establishing a responsive, highly intuitive dialogue between artist and medium. As Metz explores various surface applications, he achieves a diverse range of marks and textures, from scratches and splashes to drippings and smears, with washes of varying opacity and consistency. The frayed, irregular edges of paint, meanwhile, suggest that each form was allowed to find its own shape, the dye’s inherent qualities offsetting the artist’s hand. Consequently, these earliest paintings often come across as less deduced than discovered, products of an early stage in which the process was as instructive as it was expressive. While the same formal concerns define the next group of paintings, “Still” (2012), here we find Metz exploring them to more restrained, discerning ends. True to its title, there is a placidity to this set of works, a calmer sense of purpose which immediately distinguishes them from the animated experiments of the “On Water” canvases. Where those earlier paintings favored rough pours and discernible handwriting, for instance, these canvases display a more even application, with Metz spreading the dyes with his palms in order to achieve steadier, subtler effects. Although the resulting forms retain equally organic shapes and irregular contours, one finds far less here in the way of indiscriminate spills and smudges; those runs and drips that do remain now seem to serve a deliberate compositional function. At the same time, the artist’s palette is increasingly diluted, often to the point of near weightlessness, while the gradient transitions between colors are generally more measured and smooth. The resulting works continue to highlight the natural tendencies of their medium, but their compositions no longer seem spontaneous; they read instead as the products of a cool-headed, patient, and increasingly purposeful approach. Perhaps the biggest change we find in this second set of canvases, however, lies in their compositions, which have grown increasingly fluent and minimal. The viewer will notice, for instance, that none of these pictures contain more than three primary forms or colors; several feature only a single painted element. Within such minimal compositions, the untouched spaces of canvas assume a heightened, active role within each image, asserting the flatness of the integrated surface while emphasizing the subtleties in Metz’s application. 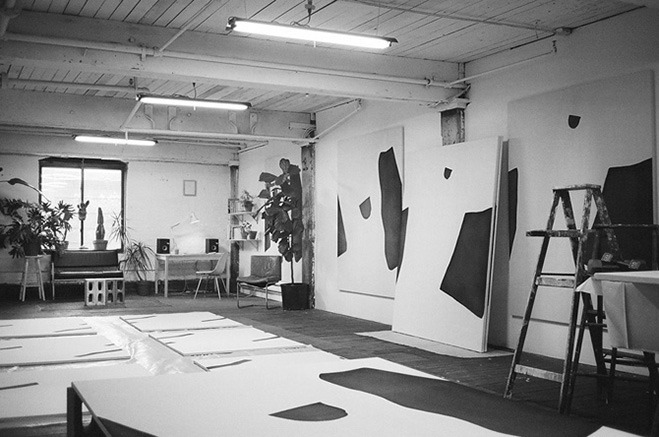 In writing about Hantaï’s work, some critics have likened the unpainted portions of his dyed canvases to “visual silence.” (3) The notion of silence applies to Metz’s works as well, but more in the sense of poetic caesurae or the spaces between musical notes – which is to say, a functional stillness, an activated space that allows a work of art to unfold rhythmically. The effect is subtle but crucial, for although Metz’s process has indeed become more controlled, the resulting canvases still come off as having materialized of their own accord – naturally, even inevitably. In time, Metz’s increasing familiarity with his materials would eventually lead him to explore new techniques. 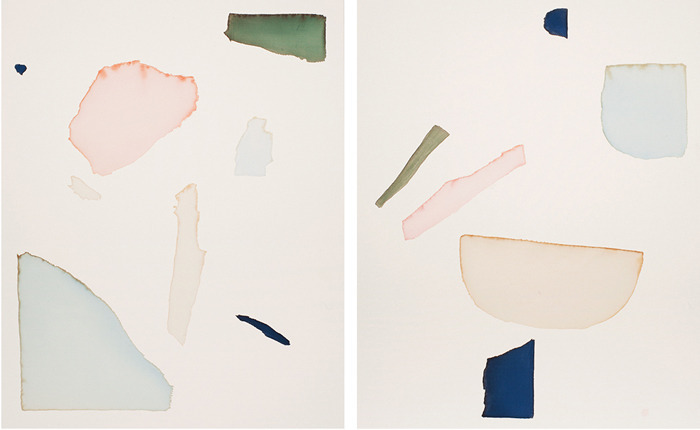 Although clearly a product of the same hand, the third set of dyed paintings, collectively titled “Varying Degrees of Absurdity“ (2013), announces an unmistakable shift in approach from the preceding series: compositions have been simplified, the forms more precisely rendered, the gestures reigned in. That Metz, for the first time in his career, began by sketching each work before approaching the canvas is evidence enough of a change in his intentions, but the process by which he produced those sketches is particularly telling: after tearing a piece of paper into fragments of varying sizes, he would let the pieces randomly fall onto an intact surface. Using these accidental arrangements as a foundation, he would then refine the compositions as desired, moving and eliminating shapes until he was satisfied with the layout. It’s only at this point that he would begin translating the idea onto canvas. It’s a process which immediately invites comparison to the strategies of people like John Cage and Jean Arp, particularly the latter’s experiments with collage, such as Arrangement According to the Laws of Chance (Collage with Squares) (1916-17). But where Arp’s pieces were exercises in automatism as creative principle, these canvases find Metz using randomness merely as a point of departure; though spontaneity retains a role in his creative process, his interest now lay in achieving a far more deliberate effect with his work. As suggested earlier, this shift in methods comes largely as a result of the artist’s increasing familiarity with his medium: after a year of constant engagement with the dyes, he had learned how to anticipate and control their tendencies. It’s a point worth addressing. 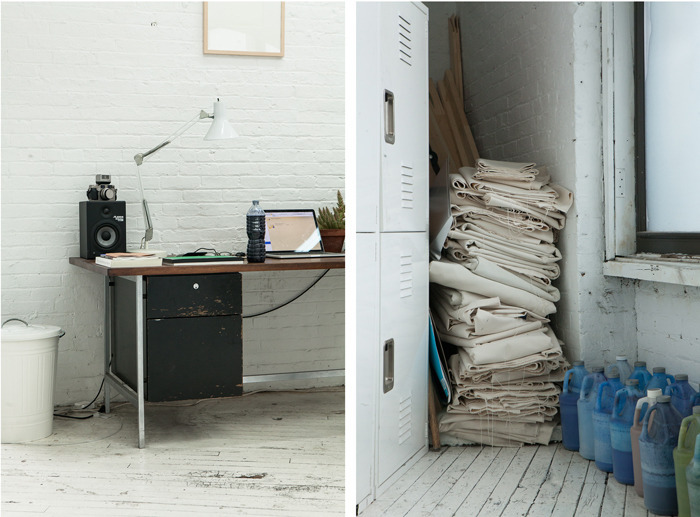 Metz is an artist whose technical facility is routinely offset by his ambition. Though his formal inventions are hard-won, he is wary of repeating himself, and consequently finds himself in the strange position of trying to develop a consistent personal style while constantly adopting new material processes. In previous years, upon reaching a particular point of fluency, Metz would have turned to a new medium as means of both invigorating his practice and reframing his project. With “Varying Degrees,” however, he decided instead to push further, challenging himself to approach these now-familiar materials in an unfamiliar way – which, in this case, ultimately meant using the dye not as a collaborator but as a conduit. Working this way, the artist accepts a new level of accountability, as the painting process no longer retains any use for surprises or allowance for accidents. Each observable effect, from the crisp definition of form to the subtle, burn-like bleeds that trace the edges of certain shapes, must now be executed precisely and purposely, with no visual element superfluous or out of place. In taking this approach, one finds Metz actively restricting his formal vocabulary. Gone, for example, is any visible trace of the artist’s hand; rather than use his fingers to confirm the creative act through animated gestures, he’s limited himself to using sponges and, occasionally, his palm to guide the dyed pigments into distinct, self-contained forms. His handling of freestanding marks has become equally restrained: where previous works embraced the accidental drip or random edge, these compositions are impeccable and precise, demonstrating a newfound clarity in their application. Consider also his palette, which, while previously enhanced by color mixtures and gradients, has been narrowed here to a set of soft but consistent shades of green, blue, beige, and peach – a nod to the influence of Matisse’s paintings from the early 1910's – with only the slightest burns and blurred edges betraying the liquid nature of his medium. By restricting these formal elements, Metz allows himself to focus instead on questions of compositional balance and visual depth. As ever, the activation of negative space remains a central concern, but what’s truly crucial in these pieces is the interplay of forms. Perhaps more than anywhere else in his catalog, Metz’s choices of size, placement, and palette here are subtle but precise. So often in these canvases, one finds that it’s the unassuming accents which hold the most visual density; though the larger forms may be the first to catch the viewer’s eye, it’s often those smaller marks that truly stabilize each composition. To that end, one might consider as a point of comparison Malevich’s Suprematist canvases from 1915, which similarly employed sparse compositions and a reductive use of color and form to create works of exacting visual balance – and which, in doing so, similarly reflected theories regarding our very perceptions of reality. Even with this level of compositional nuance, however, the true strength of the “Varying Degrees” canvases ultimately comes less from their graphic strategies than from a shared structural logic. Where preceding works saw Metz offsetting the integration of medium and ground with the suggestion of visual depth, these paintings find him, for the first time, asserting a literal surface. He has removed any sense of foreground and background in these paintings; though the compositions continue to rely on spatial tension, there is no gradient, no push and pull to sustain the illusion of dimension in pictorial space. Moreover, where both the “On Water” and “Still” paintings contained washes reaching to the very edge of the canvas, as if each composition were a cropped detail of a larger image extending beyond the boundary of the picture plane, all of the forms in these most recent works are contained within the frame, with a margin of untouched ground reinforcing the limits of the canvas. Combined, these strategies result in a pronounced flattening effect, with all forms lying on a single plane, flush with the face of the canvas. Both physically and visually, the image and object have truly become one and the same, and as a result, the viewer must realign his perception so as to see the work’s graphic signifiers rather than see through them. As such, we once again find the artist using his work to encourage the audience to forgo pretense and encounter each item on its own essential terms – an idea with implications extending beyond our experience of artworks. A fourth and most recent set of dyed paintings, initiated in the Fall of 2013 and still untitled at the time of this writing, distinguishes itself from preceding series largely through its methodology: where Metz has to this point built up each body of work a canvas at a time, this most recent sequence finds him for the first time thinking in terms of self-contained groupings. The series encompasses two distinct strategies, each equally systemic in their approach. First, there is a group of triptychs, pre-sketched and realized according to a common basic arrangement: on the far left, Metz produces a painting in the basic vein of the “Varying Degrees” works; for the remaining two works, he isolates a few given forms from the work and reframes them as compositions unto themselves. In each case, the artist renders the works on 80 x 64” canvases, his largest format to date. The first paintings are noteworthy for the subtle update they make to the “Varying Degrees” formula: while they share the same arrangements and forms as the earlier works, they find Metz experimenting further with notions of palette and visual density, as he allows the darker colors – previously restricted to accents and smaller forms – to assume the work’s more prominent shapes, resulting in a palpable shift in both visual balance and overall tone. For each of the second canvases, meanwhile, Metz embraces an extreme economy of form, restricting his compositions to only a few monochromatic marks. By removing the element of color interaction from his arrangements, Metz places even more prominence on the size and placement of form, crafting intricately designed compositions defined by their asymmetrical balances and highly activated fields of negative space. Given both the sparseness and sheer size of these second canvases, the viewer’s first inclination will likely be to read the works comprehensively, taking the entire composition in at once, perhaps from a physical distance. Upon closer inspection, however, one finds a great deal of content in the details, as in appropriating his forms, Metz has altered them in subtle but deliberate ways, eschewing the flatter application and harder edges of the “Varying Degrees” canvases in favor of saturated colors and understated gradients culled from the “Still” series. Produced alongside the triptychs are a series of diptychs, with Metz producing a work in the “Varying Degrees” style and then immediately reproducing it in precise detail. With each inch of the first composition methodically echoed in the second, it becomes all but impossible to read any meaningful difference between the two canvases, the slight variations merely affirming their handmade nature. It’s a strategy which immediately calls to mind Robert Rauschenberg’s Factum I & II (1957), which similarly found the artist using direct visual comparison to refute any readings of offhandedness or accident into compositions that might otherwise appear spontaneous. In implementing these new strategies, Metz explores more literally what has long been a central idea within his broader practice: namely, that an artist’s process might be self-generative, with strategies extended and refined through succeeding works. Though individual motifs may be isolated or emphasized, they are at once defined and enhanced by their connection to a broader arrangement; though each given work offers its own points of visual interest, it must be viewed in context, as part of a larger set, for its function to be fully grasped. Simultaneously individual and interdependent, these canvases thus reinforce through presentation the same notions of interconnectivity that Metz has previously applied to both his technical methods and compositional strategies. All considered, the paintings discussed in this text are ultimately about transparency: from his emphasis on the inherent traits of his materials to the very shift in perception he proposes to his audience, one recognizes in Metz’s work a desire to achieve that quality which lays bare “the luminousness of the thing itself, of things being what they are.” (4) It’s a condition which promotes eloquence as opposed to opacity, openness as opposed to impenetrability, distinctiveness as opposed to calculated difficulty. It evokes notions of accountability, self-knowledge, and lucid discernment; though not the same as blatancy, even earnestness, it speaks nonetheless to a certain kind of directness in presentation. That we find these qualities so consistently embraced in these works is, I think, enough to confirm their value within contemporary conversations. In a time of listless, nondescript "process-based" abstraction, Metz’s canvases stand confident and available in their aesthetic clarity, the results at once intellectual and intimate, pictorial and personal. In lucidly translating the artist’s intentions through unapologetically vibrant presentations, they come as a timely reminder of what the best works of art provide us: a direct, sensual, and subjective experience which, given our willful investment, moves us in their wake to enter into subsequent encounters – artistic and otherwise – as keener, more committed participants.